Leave it to a sharp-eyed reader to remind me of what I know, but did not think to include in my recent post on García's method of blending the registers. 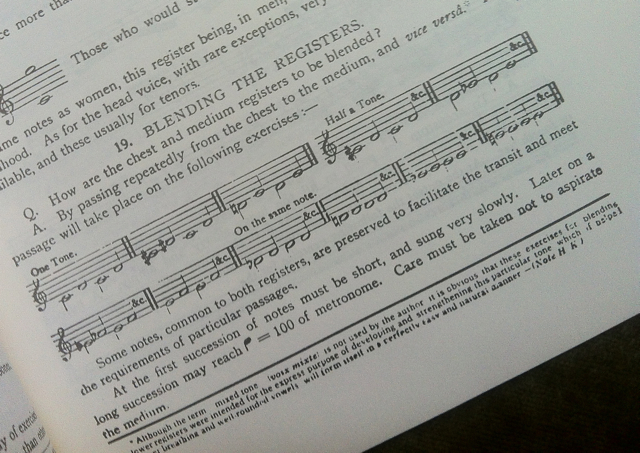 There, in a footnote in García's Hints on Singing (1884), Herman Klein—who's own manual appears on these pages and was García's editor—puts things rather nicely, using the term voix mixte and middle instead of falsetto, the whole idea being to strengthen the middle through the use of "well rounded vowels." Well… that certainly accords with the diary notes I found and wrote about in my last post on the subject, don't you think? One thing to keep in mind. The method I found is an auditory one, rather than a mechanical one. Let me explain. You can tell a student to "round" the vowel, but he won't know what you'll mean. Sure, he'll try to do something in his throat, and he'll most likely tangle himself in knots. However, if you ask him to sing a clear /i/, and then sing the same pitch (try it lower in the range to start off with) on /ü/, the vowel will have been rounded by the inner actions of the ear. Do you see what I am saying here? Those using this method will find that the tricky part is 1) making a clear open-throated /i/, and then 2) making a clear open-throated /ü/. Most American students have a hard time with this later vowel. Once the student can do it with ease, you can then draw their attention to the mechanics, that is, what is going on in the musculature of the face and throat. Keep in mind however, that if they try to control their feelings directly, they are asking for trouble. The sound has to come first. You have to keep your eye on the ball!